In Burkina Faso, A Minibus Brings Free Cervical Cancer Screenings To Villages : Goats and Soda The cancer takes a devastating toll in sub-Saharan Africa. In Burkina Faso, health workers have come up with a creative way to offer free screenings in the farthest corners of the country. 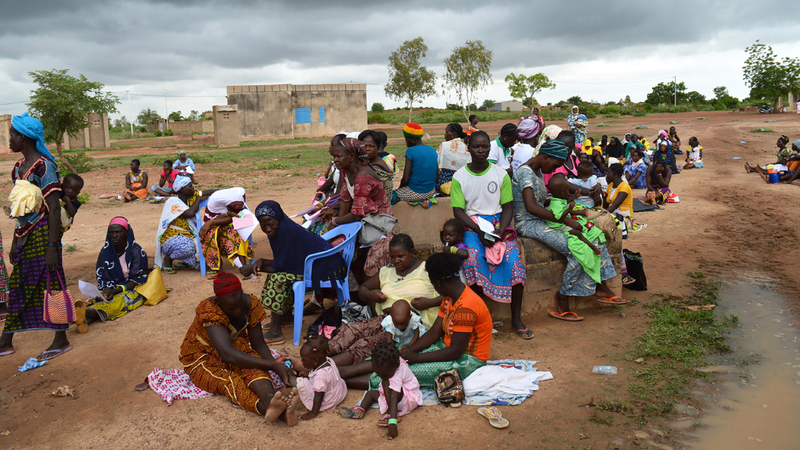 Women wait by a maternal health care clinic in Pabre, Burkina Faso, for a free cervical cancer screening. Well before the minibus pulls in, a crowd of 100 women has gathered, many toting children. More continue to arrive by bike, on foot. Soon they spill out from under the shelter of two tents that constitute a makeshift waiting area. Some cluster among trees. Others lean against the village maternity building, a five-room structure that many have never set foot in because they gave birth at home. It's no ordinary bus that they're waiting for. Outfitted with a metal exam table, a nitrous oxide gas tank and shelves stocked with cotton swabs and medical gloves, it's a cervical cancer exam room on wheels. And it's coming toward the rural village of Pabre, about 15 miles from the capital of Burkina Faso. 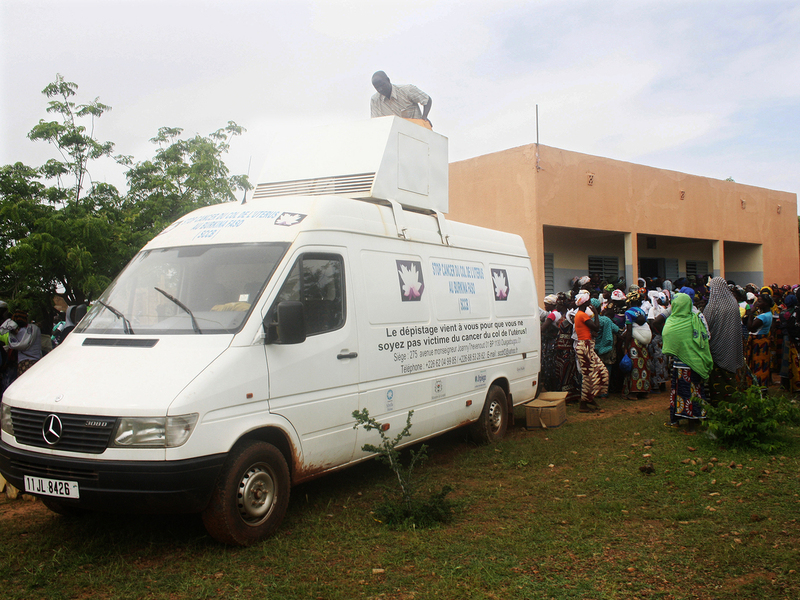 Women wait outside a maternal health facility in Pabre, Burkina Faso, to be screened for cervical cancer in this minibus. The vehicle is outfitted with a metal exam table and a nitrous oxide gas tank. On this day, midwife Mariam Nonguierma feels confident they'll reach their destination. It's when the villages are remote, and when the rain turns roads into rivers, that she worries if they'll get to where they're going. The women have come for a free screening for cervical cancer. Many of them know someone who has had the cancer. And they fear they might have it as well. Invariably, Nonquierma's team ends up turning away women who are eager to clamber aboard the mobile clinic. It pains her to no end to have to tell women who have no other means to get the life-saving preventive screening and treatment that resources are too limited to accommodate everyone. That there are not enough hours in the day, not enough personnel or supplies — some days, not enough cotton swabs — to do the rather simple screening exam referred to as VIA, or visual inspection with acetic acid. "Each time that we go, we are never able to see all the women who come out to be screened," she says. "Never. Each woman wants to be seen. But here, in Burkina Faso, it is only those who are lucky who will receive the screening." That worries her — for good reason. Low- and middle-income countries like Burkina Faso bear 70 percent of the global burden of cervical cancer. In sub-Saharan Africa, 34.8 new cases of cervical cancer are diagnosed per 100,000 women annually, and 22.5 per 100,000 women die from the disease. These figures compare with 6.6 and 2.5 per 100 000 women, respectively, in North America. Medical professionals in Burkina Faso say the highest death rates occur in regions like Pabré — outlying areas where the nearest health center may be more than 15 miles away. Even if there is a local health center, it often does not have the resources or providers trained in performing cervical cancer screening and treatment. These women typically do not have the time or money to travel to the capital where screening and treatment is offered at the major hospitals. Dr. Jean Lankoande, a professor of gynecology/obstetrics at the University of Ouagadougou, started Stop Cancer du Col de l'uterus au Burkina (SCCB) in 2012. It's funded by private donors. "I thought, why is there nobody working to improve the care for these women?" says Lankoande. "It is a cancer that can be prevented." Cervical cancer, most often caused by infection with the human papillomavirus (HPV), is preventable through early detection and vaccination. Nonguierma played a pivotal role in the creation of SCCB and has been involved ever since, not only as a direct caregiver but as a trainer of midwives and nurses in cervical cancer screening and treatment. Twice a month, a group of SCCB volunteers — from a pool of more than 20 Burkinabe doctors and 40 nurses and midwives — take the mobile exam room on the road. The bus was Lankoande's idea. Today, Nonguierma is leading the team of eight health workers to Pabre. They're bumping along the road to the village in a long convoy of rental cars, with the bus leading the way. 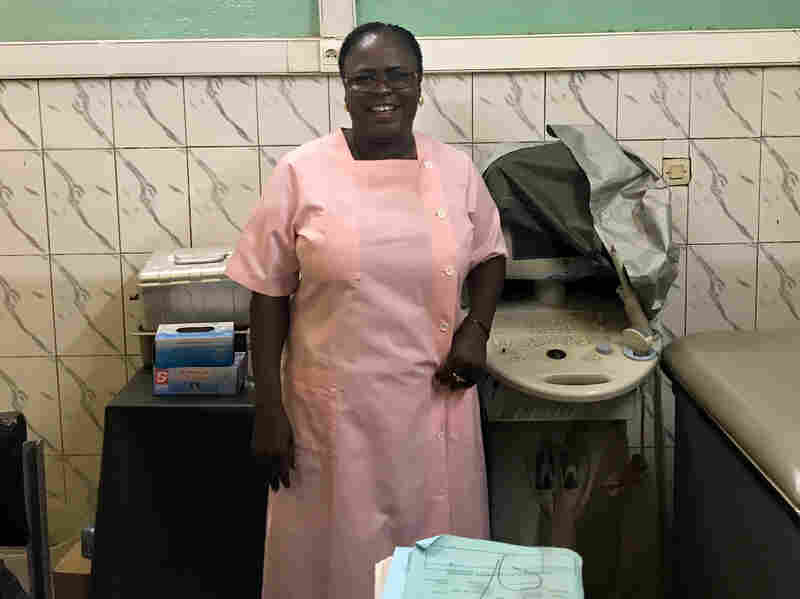 Midwife Mariam Nonguierma in her office at the University Teaching Hospital Yalgado Ouedraogo in Ouagadougou, Burkina Faso. She was instrumental in the creation of the cervical cancer screening bus. She and the other midwives and nurses will conduct a visual inspection of the cervix. If precancerous cells are identified, they will provide immediate treatment with cryotherapy, a freezing technique using nitrous oxide gas that destroys potentially lethal cells. Nonguierma is practiced at explaining the procedure. She calms the fears of women who've never in their lives offered up a bare arm to have blood pressures taken, much less hiked up skirts for a screening. Meanwhile, the volunteer physicians perform surgeries when advanced lesions are identified. All of this takes place right on the bus. This process, called a "single visit approach," was pioneered by Jhpiego, an affiliate of Johns Hopkins University, in the early 2000s. The main advantages of the approach are that it requires few resources, uses low-tech equipment and provides immediate results. To date, SCCB has screened more than 20,000 women across Burkina Faso using this method. Nonguierma has never made a trip when she hasn't seen at least one invasive case of the disease, often in a young woman with children. "This is very difficult, when you see a woman who has the cancer who has never received a screening." says Nonguirma. "At this point it is often too late." Invariably, the team ends up turning away women — the young and old and in between — who are eager to climb aboard the bus. The SCCB team's efforts to serve remote areas in Burkina Faso are a "critical first step to build trust and deliver community outreach to women who need it the most," says Philip Castle, the executive director of the Global Coalition Against Cervical Cancer, who is not affiliated with SCCB. "The next phase is how do we get [HPV testing] available to all women, no matter where they live." In addition to the screenings, SCCB educates local health workers about cervical cancer. "We never leave these sites without training the local nurses and midwives, and giving them materials so that they can continue the screening when we are gone," says Lankoande. Momentum is building around their efforts. At an event in November, the group was recognized by the First Lady of Burkina Faso, Sika Kaboré, for its efforts to curb the disease — and an Italian foundation called the Daughters of St, Camillus announced it would give the group $20,000 in funding. SCCB will use this money to purchase a second bus that will be turned into a mobile exam room. Nonguierma can't wait to take this second bus, which will be slightly larger than the first one, on the road. For now, as the SCCB convoy draws close to Pabre, she takes a moment to brace herself. Soon enough, at the end of this long, long day, she'll need to face the unlucky women, the ones she'll have to turn away. Matthea Roemer is a graduate student at the Johns Hopkins Bloomberg School of Public Health. She recently spent six months in Burkina Faso as a university-funded global health fellow working with Jhpiego to conduct family planning research. While there, she reported this story.